“42” is an old-fashioned inspirational and ultimately uplifting drama about perseverance in the face of turbulent opposition. 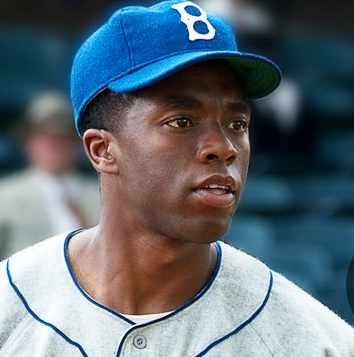 And the greatest credit to writer-director Brian Helgeland is that none of this is shown through grand melodramatic movie monologues, but through the simple restraint of Chadwick Boseman’s portrayal of a determined and resilient Jackie Robinson. In “42,” baseball speaks much louder than words. You’ll be hard-pressed to not feel inspired by the film’s end, or leave the theater with a greater appreciation of what Jackie Robinson has done for civil rights and equality. By the way, the film’s rating, PG-13, was earned for its historically accurate use of racial slurs.